London Staff Retreat, 2007. 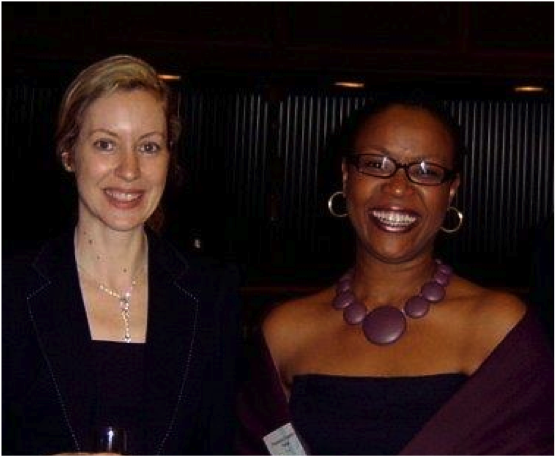 Sandra Coyle (l), Proserpina Dhlamini-Fisher (r). Photo courtesy of Anthony Tait. Do the words ‘internal” and “communications” make you want to cringe on the inside and roll your eyes when no one is looking? I once felt the same way but quickly saw an opportunity, a blank canvas that calls for great creativity with potential to increase brand awareness among staff. Over the years, I’ve developed four sets of internal communications tools, that when combined, can dramatically increase staff brand awareness and inject some excitement into the reality of the day job. This is particularly important in global organizations with offices located worldwide and with few staff having the ability to meet in person. These tools will close the geographic and interpersonal gap while educating staff on the brand and the organization’s activities and goals. Friday Weekly Digest: A compilation of aggregated news on your organization and your industry. Software like Paper.li make the publishing process seamless. Send via your e-marketing system to all staff or straight to an all staff email address. Consider offering this to the wider public via Twitter, Facebook, Google+ once the process is perfected. Monthly Staff eNewsletter: Use stakeholder-generated content from staff and external stakeholders to expand knowledge of your organization’s work and of each other. Use videos as much as possible and encourage staff to share their own videos, especially if they work remotely. Encourage them to interview each other. You can get very creative here – hold contests, include a Proust questionnaire, interview different divisions, include videos of events, speeches and panel presentations and highlights from social media. Use e-marketing software to produce, publish and measure readership preferences. Monthly Forums: First Mondays, Tuesdays, Wednesdays, whichever you like, one day a month that is reserved to share expert knowledge on issue areas or new projects. This can be done via Skype or BlueJeans network if you are working globally. It should be led by different staff members and outside experts. This can be used in a “brown bag” lunch style for your offices worldwide to invite partners and other external stakeholders. The key is that attendance is optional and it is for professional development. Intranet as Social Media: The designer who worked on my site was the brainchild for a Facebook-like intranet at the international organization we worked at. We had profiles, follows and most active lists. It was a great way to engage staff in ways that they were already familiar with. The most active list became hotly competitive offline as well – a race to the top and a great way to encourage engagement. Just be sure you have a single sign-on or another easy way for staff to access the intranet and be aware of your stakeholders. If most staff is under 45, it’s a great approach but if your staff is older, you will need to survey them to see how they want to interact with the intranet and include their feedback in your plans. And there you have it. You may want to introduce one or two tools over a three-month period and then build up to all four within six months to a year. Your e-marketing measurement will help you determine which article topics are most popular so that you can adjust your editorial calendar moving forward. Staff surveys on internal communications should be done about twice a year anonymously to gauge whether the content, format, frequency and variety is meeting their expectations. Internal communication channels can build brand awareness among your staff and bridge geographic distance within a global organization. Use three to four tools that can you adjust as you go based on survey feedback. Survey no more than once a quarter. Preferably two times per year to ensure you are meeting the needs of your audience. Be creative and involve all staff. Not only will they learn new skills it will help them learn more about the organization and will create word-of-mouth about the communication team’s work worldwide.